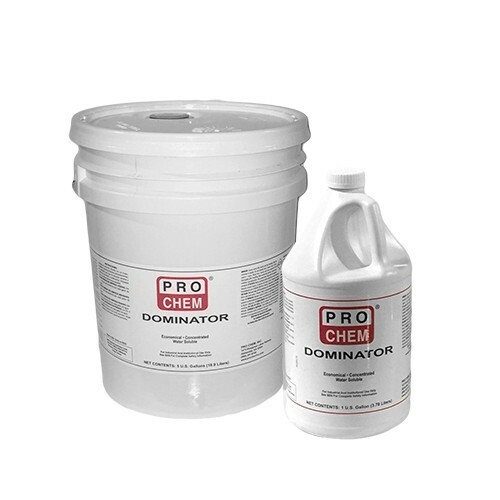 Dominator | Pro Chem, Inc.
DOMINATOR is designed for the toughest degreasing applications. It effectively removes grease, oil, gum, resin, ink and almost any other soil from most washable surfaces. It can be applied by almost any means including automatic scrubbers, pressure washers, soaking, trigger sprayers and mops. Apply diluted solution with mop, sprayer or soaking. Allow sufficient dwell time to penetrate and loosen dirt and grime. Rinse thoroughly with potable water. FOR LIGHT DUTY CLEANING: Use 1 – 1½ oz. of product per gallon of water. FOR MEDIUM DUTY CLEANING: Use 3 oz. of product per gallon of water. FOR HEAVY DUTY CLEANING: Use 4 oz. of product per gallon of water. FOR PRESSURE WASHERS: Use 2 1/3 – 4 oz. of product per gallon of water. NOTE: Not for use on aluminum. Care should be used on painted surfaces.